Brandon Gill as Bowzie, politicized in his first months of college, and Hampton Fluker as Tony in Too Heavy for Your Pocket. Above: Fluker with Nneka Okafor (left) as Sallie-Mae. Photos by Jeremy Daniel. Bowzie Brandon (Brandon Gill), protagonist of Too Heavy for Your Pocket, is a brainy 20-year-old, raised in poverty, now a full-scholarship freshman at Fisk University, alma mater of W.E.B. Du Bois. Bowzie’s wife, Evelyn (Eboni Flowers), lifelong friend Tony Carter (Hampton Fluker), and Tony’s spouse Sally-Mae (Nneka Okafor) are awed by his status as “the first man in this whole neighborhood to go to college.” They believe he’s destined for success beyond the reach of anyone else in their blue-collar, all-black community. The Brandons and Carters are good country people who’ve moved to Nashville seeking prosperity unknown in the rural places where they were born. Both wives are pregnant and both couples hope to give their expected children advantages they haven't had themselves. How best to secure those advantages, though, becomes a topic of intense conflict when Bowzie meets James Lawson, a man of conscience and charisma representing Dr. Martin Luther King’s Southern Christian Leadership Conference (SCLC) and CORE. Lawson is a historical figure, integral to the civil rights movement, who’s still living. In Too Heavy for Your Pocket, he’s an offstage character whom Bowzie describes as “one of them niggahs been riling up the ofays at Woolworths” with lunch counter sit-ins and shopping boycotts. 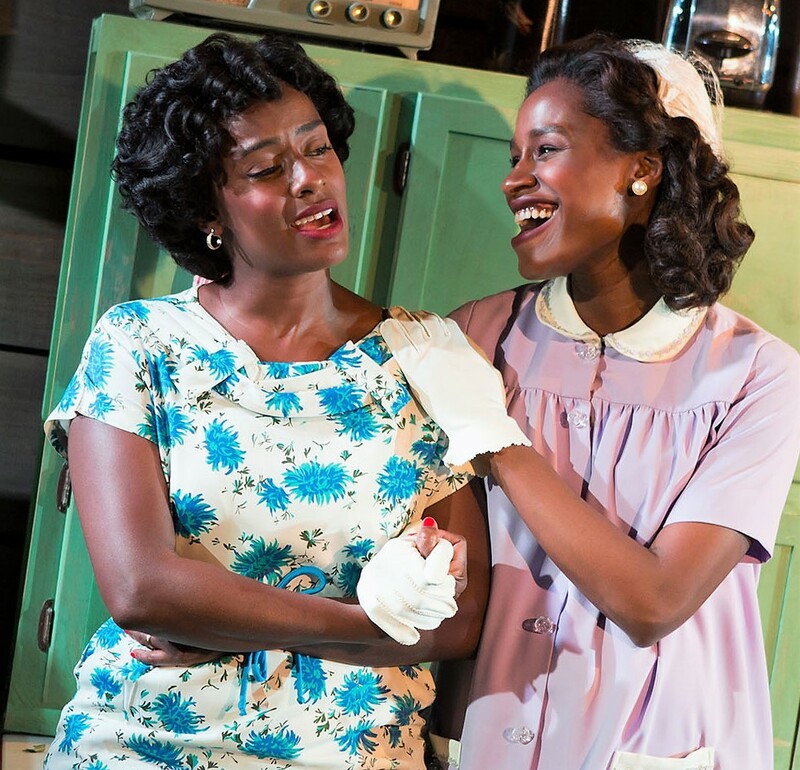 Eboni Flowers (left) as Evelyn with Okafor in Too Heavy for Your Pocket. It’s his duty, Bowzie decides, to abandon the safety of college and cast his lot with the Freedom Riders. But leaving Fisk, even temporarily, means forfeiting his scholarship and all prospects of university credentials. And joining the Freedom Riders puts him at odds with Evelyn and the Carters, who believe he’s being irrational, reckless and, most of all, indifferent to the welfare of his family (including an unborn child). Playwright Holder—a 2016 graduate of Yale Drama School who’s making his New York debut—has created intricate, recognizable characters and dialogue that bristles with verisimilitude. Under Margot Bordelon’s direction, the four fine actors form a beautifully balanced ensemble. Flowers as Evelyn in Too Heavy for Your Pocket. Too Heavy for Your Pocket received the 2017 Laurents/Hatcher Foundation Award, which comes with a generous grant for production of the script by a nonprofit theater; and the Roundabout Theatre Company is giving the play a top-notch production in its 62-seat black-box theater. Reid Thompson’s simple scenic design and Valérie Thérèse Bart’s Kennedy-era costumes convey both the Brandons’ proud values and the hardscrabble nature of their existence. Last summer Richard Allen and Taran Gray’s Freedom Riders: The Civil Rights Musical got a special citation for social relevance and impact at the New York Musical Festival. That ambitious show depicted conflicts among movers and shakers of CORE, SNCC, and SCLC. Holder has taken a very different direction in his intimate, small-cast drama, portraying men and women who, though living at a crucial moment in African-American history and in proximity of social revolution, are too fettered by dire economic circumstances to be mindful of anything other than subsistence. 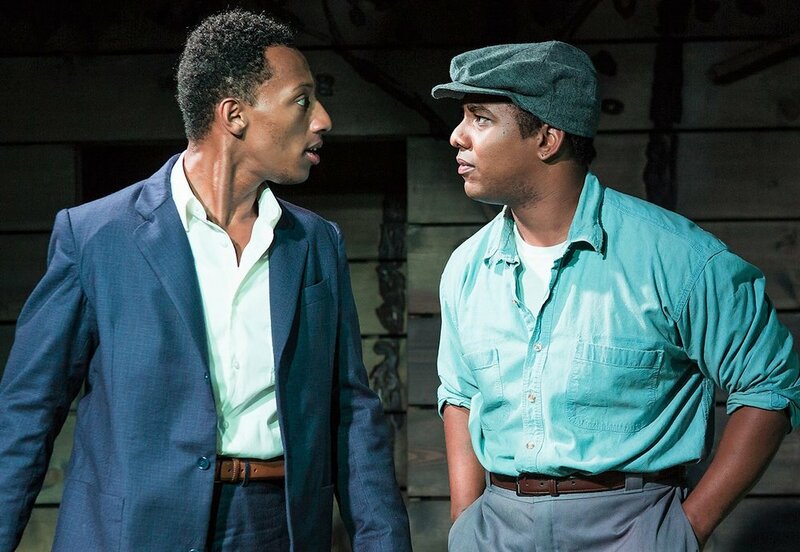 In Holder’s play, Bowzie struggles onto the bus with other activists, but finds himself bereft in a Mississippi state prison as better connected Freedom Riders are bailed out by relatives and friends. Holder is fortunate to have had three years to hone his craft at Yale Drama School. The Laurents/Hatcher prize, with its $100,000 purse to ensure production, is a breathtaking benefit. But the artistic intelligence, psychological insight, and native talent on view in Too Heavy for Your Pocket would have demanded expression regardless of the playwright’s advantages and good fortune. The Roundabout Theatre Company production of Too Heavy for Your Pocket runs through Nov. 19 in the Black Box Theatre at the Harold and Miriam Steinberg Center for Theatre (111 West 46th St.). Evening performances are at 7 p.m. Tue.–Sat. ; matinees are at 1:30 p.m. Saturday and 2 p.m. Sunday. Tickets are $25, available by calling (212) 719-1300 or visiting www.roundabouttheatre.org.